October is here, and while many raw foodists are waving good-bye to the fabulous summer fruits that just are out of season.. I will miss fond memories of purple mulberry juice running down my chin and Indian red peach juice staining my teeth... There are new "in-season" fruits that are just appearing.. persimmons, apples, pears, grapes, and citrus soon to be here.. Although one really delicious in-season fruit often overlooked: The Mango... The number one consumed fruit in the world. Mangos have been cultivated for over 4,000 years. Originally from Southeast Asia. They are grown in sub-tropical and tropical regions of the world. Mango trees are evergreen trees that grow 60 feet tall and produce fruit within 4-6 years. The Mango tree belongs to the sumac family (Anacardiaceae). Which is the same family as poison sumac and poison oak. This is why some people get a mouth rash from eating mangoes. I usually like to wipe up any mango juice and sap immediately after eating, and also avoid eating the peel. It is October in California, and we are in the middle of the California-Grown Mango Season. Yes, mangoes do grow in some parts of California! The region they are grown commercially is the Coachella Valley which is just over 90 miles to the border of Mexico. In the desert-like conditions, the Keitts were selected after trials of 50 varieties for commercial viability. There are two major commercial growers of mangoes in California. The Keitt was selected for its frost tolerance, although during the freeze last January, many small trees were lost, although established trees suffered minimal damage. So yields were down this year. All Mangoes may not be raw! Did you know that imported mangoes must be hot water treated and may not be considered raw? Read the USDA APHIS hot water treatment guidelines. Almost all imported mangoes must be hot water treated to kill pests (fruit fly) which also is known to diminish the aroma, affect the flavor and cause a pasty flesh as well as shriveling.. Yes.. They must hot water treat organic-imported mangoes as well. The guidelines state that hot water treatment is at a minimum of 115 F. degrees. Other sources online state that the temperature should be about 122 degrees F. Treatments can last for as long as 90 minutes!! Of course, this is the external surface of the fruit, does the inside of the fruit really heat up that much? I hope not. But at least be aware this is what is happening to all imported mangoes. See for yourself! On the outside of every imported mango box, there will be a stamp USDA APHIS hot-water treatment stamp. 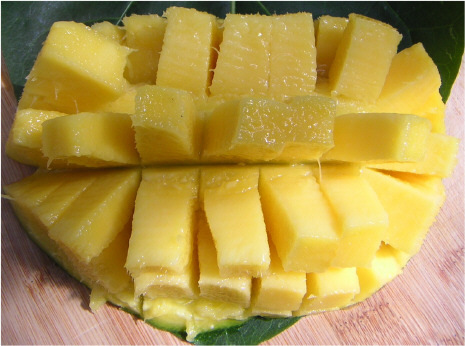 Some people in the Raw Food Movement no-longer consider mangoes "raw". Of course, I eat imported mangoes, when that is the best food choice. (Of course, I would rather have home-grown, farmers market grown, or local produce ) but sometimes during the winter, its the best you can do! I do consider them raw, because the core temperature does get too hot in my opinion, and they still do go bad. Well, not to worry! California Mangoes have no-need for hot water treatment, so they are raw. Better yet, many California mangoes have Organic Certification! What better than that! The Keitt mango is an Indian strain of the mango thought to have originated from a seedling of Mulgoba mango variety grown in 1945 in Homestead, Florida. The Keitt Mango is grown all over the world, including Florida, Hawaii, Puerto Rico, Israel, Mexico, Australia and South Africa. The California Keitt Mango is grown using organic and non- organic methods. It is reported that when one of the growers got certified for organic standards, they said their cost went up, since the weed control was more expensive.. What does this probably mean? They spray chemicals to kill the weeds between the trees in the orchard of the non-organic mangoes..
Don't be scared to purchase one of these green. Many people think produce that is green are not ripe. This is not always the case. With the Keitt mango, they ARE RIPE WHEN GREEN! They turn from orange-green to bright green when ripe. Since the California Keitt Mangoes are grown in California, they can be left on the tree longer than imported mangoes, which provides a sweeter, more mature mango. The Keitt Mango is a virtually fiberless (less stringy) fruit, so it has a really nice smooth texture. Ripe ones are ever so sweet and delicate tasting. They are only available for a short 6 to 8 week time span during September and October.. These are large fruit. They have been reported to weigh as much as 5 pounds. The largest Keitt Mango I purchased was over 2.5 pounds! That's one big mango! The flesh of the mango is golden-orange and the taste is quite delicate, with a hint of lemon undertones and a smooth sweetness . 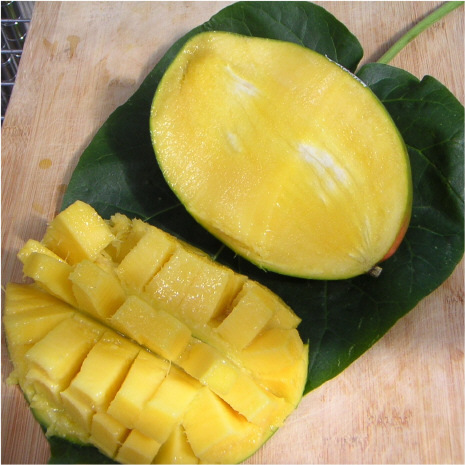 The seed is a small flat seed, which makes cutting the mango easy. Of course, as with other fruits, mangoes are low in calories and fat, but high in nutrients. Just 1 cup of mango contains 68% of the RDA for Vitamin A and 80% for Vitamin C. Mangoes also contain potassium, vitamin B6 and of course, fiber. Selecting a ripe California Mango can be tricky. For people that have been to tropical locations and have picked ripe mangoes know what I mean. Picking a unhot water treated mango is different than picking a hot water treated mango. 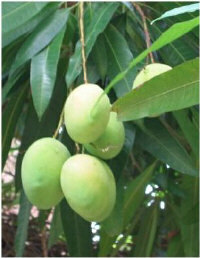 Most people are familiar with picking a ripe mango that has been imported and hot water treated. Usually you need to pick one a bit more softer than normal. When picking a un-hot water treated mango, you need to ensure that it is more firm than an equivalent hot water treated mango, otherwise you will have picked one that is OVER RIPE! Trust me, I have done this on more than one occasion. If you don't remember anything else in this article, remember this! So you want to check ripeness like you would an avocado. Hold the mango in the palm of your hand and give a gentle squeeze. Please don't bruise the fruit! A ripe mango will give slightly and have an overall feeling of softness. When they are ripe, store in the refrigerator and eat within a few days. If they are not ripe, I like to store my mangoes and other fruits at room temperature. I also like to smell my fruit and look for the clear 'sap' that sometimes drizzles out of the stem end.. for indicator of ripeness. If you buy them hard, don't worry, just put the mango in a bag with a banana or apple, and the ethylene gas will help to hasten the ripening process, and usually within 3-4 days, you should have a ripe mango. Last year, I was traveling in Baltimore, Maryland and found Organic California Keitt Mangoes at the Whole Foods on Fleet Street on sale for 99 cents each. Needless to say, California mangoes consisted of a large percentage of my diet that trip. I was just out there this year, and there were no mangoes to be found. Now back in California, I was surprised to see them available at my local health food store. The price ranges from $1.69 to $3.49 depending on the size and the store selling the mangoes. Organic ones were more towards $2.49 and up, and the non-organic were $1.69. The average price is $2.49 each. 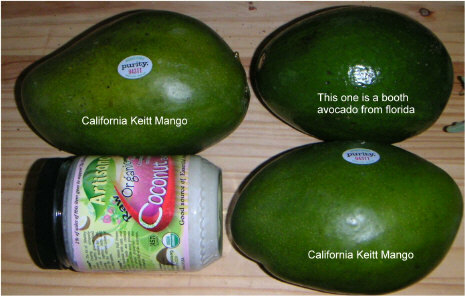 In the Bay Area the Keitt California mangoes can be found at Monterey Market and Berkeley Bowl, both in Berkeley, California. In previous years, I have purchased them from Whole Foods, Trader Joe's, Raley's. Ask for them at your local supermarket, as "California Keitt Mangoes". Often times, they are sold or available under the Melissa's Specialty produce brand. 1 Ripe Cayenne Pepper - or other RIPE hot pepper! Remove pulp from mango. Place in Vitamix or other high power blender. De-seed and de-stem the bell pepper and place in blender. De-seed, de-stem the cayenne pepper, and add 1/4 to 1/2 or the whole thing, depending on how "hot" you like. Then blend on high to make the dressing. Sample and add more hot pepper if its not hot enough for you. Its always better to start off adding a little hot peppers, since you can always add more hot pepper later. If you make it too hot to start, then you need to add more mango,and more red bell pepper to dilute the hotness. This dressing makes enough dressing for one or two. (depends on how much dressing you like). Sometimes I like my salad to be swimming in dressing!! So double this recipe if you like dressing! Please note: Hot peppers should not be green, if they are green, they are not ripe, and I do not advise using them. Hot peppers will change color to a red, orange, yellow or other color when ripe. About the author, John Kohler has been on the living and raw foods diet for over 12 years; he turned to living foods for healing from a life threatening-illness (spinal meningitis) and has enjoyed dynamic health ever since. One of Johns goals is to educate the world about the power of living and raw foods. 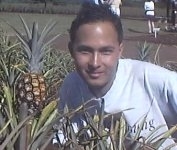 He is the founder and webmaster of the largest living and raw food website on the internet, www.living-foods.com, and www.rawfoodsupport.com. John is also the number one expert on raw foods appliances and gadgets in the world. He is widely sought out and regularly speaks and instructs at many raw food festivals and events. His area of expertise include recipe demos with 5-7 ingredients or less, young coconut recipes, traveling while raw, raw food appliances, successful transition to the raw foods diet, and the importance of a fresh organic whole foods diet. He believes that by using fresh, organic, and whole ingredients, that simple, healthy, and delicious recipes can be made with few ingredients and without the use of salt, oil, spices, refined sweeteners or chemical additives. He is known for his pragmatic approach to raw foods and has coached and helped thousands of people to incorporate more fresh raw fruits and vegetables into their diet. John is also available to individual raw food coaching.